Hereâ€™s yet another spicy recipe for all spicy food lovers. The name â€œKaara Baathâ€ in local dialect literally translates to Spicy Pudding. 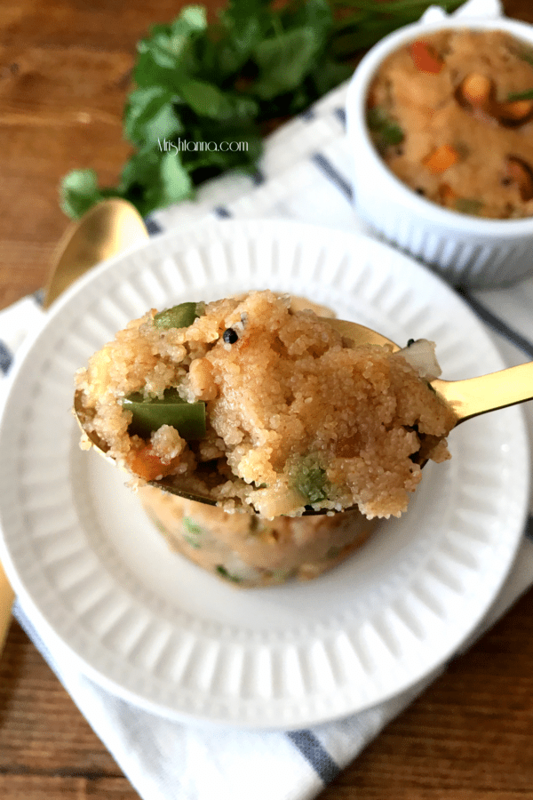 I have shared a couple of â€œupmaâ€ recipes in the past and todayâ€™s recipe comes close to that except for the fact that is had a wider mix of spices and hence a good recipe to add more vegetables than any upma. Kaara Baath is one of the popular breakfast in south India, especially Karnataka. It is usually served with a side of coconut or tomato chutney and a small serving of Sweet Rava Kesari. 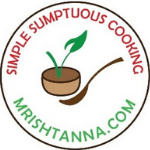 Just like Upma, the base for this recipe is coarse or fine semolina. If you are unable to have wheat-based rava or semolina, you can make the same recipe with oats or even Polenta. You can get a little creative by adding your choice of vegetables. I added carrots and Bell Peppers to my recipe. Other than the vegetables, the secret for the wonderful taste is from the spice mixtures. 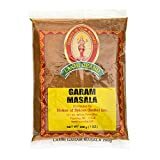 Apart from the spices used for tempering, you will also need Vaangi Baath and Garam Masala as well. Kaara Baath can be enjoyed as breakfast, lunch, or even as an evening snack. The trick in getting the authentic taste is by letting the vegetables cook in the same broth with all the spices added. Since the vegetables take longer to cook, you will need to add them well ahead of the Rava. 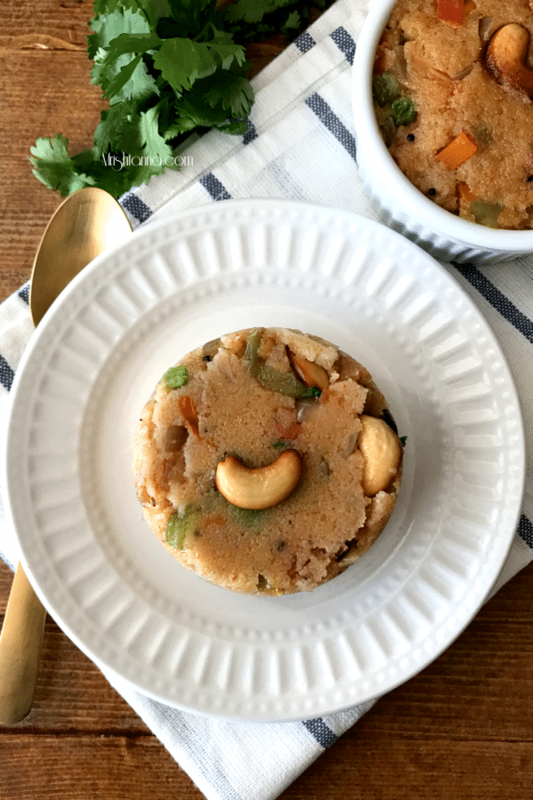 I hope you try this traditional South Indian dish today and enjoy it! If you have any questions or comments, feel free to leave a comment here or on my facebook page. For more delicious vegan recipes such as this sent directly to your inbox, just subscribe to my newsletter. You will also get a copy of my e-book where I have put together some simple vegan dessert recipes and dessert essentials. My readers have found it very helpful and I am hoping you will too! Place a pan over medium heat and dry roast the Rava/ Semolina until it gives off a roasted aroma. Place it aside. Fry the cashews with a teaspoon of oil and place it aside. In a big vessel add 3 tbsp oil and temper the following ingredients: Mustard seeds, Cumin, Chana dal, Urad dal, and few curry leaves. Allow them to splutter. Add green chilies and ginger sautÃ© for about 2 minutes or until the raw smell disappears..
Add tomatoes and sautÃ© until they are soft and add remaining veggies. Cook for 30 seconds. Add Vangi bhath powder, Garam Masala, and chili powder and sautÃ© for another 15 seconds. Add 3 cups water and place a lid over the top and let it boil. While the water is boiling add one more tablespoon of oil. Add the roasted rava to this and whisk to get an even mix. Place a lid again and let it simmer for at least 3 minutes. Now, garnish with fried cashews and cilantro. Kaara Baath is ready! Serve hot with a side of coconut or tomato chutney and sweet Rava kesari. A plate of khara bhath with some coconut chutney is quite enough for me to finish my breakfast or dinner without any fuss, never get bored of this ultimate dish. This simple breakfast of Khara and Sweet baath is what I relished in Bangalore last year during my visit and loved it. I love your version of adding the vangi masala powder to the upma, sounds flavourful, Uma! Simple and delicious breakfast recipe with lots of veggies. Thanks for sharing . I love Khara bhath with coconut chutney. Such a healthy, yummy and delicious breakfast! I sometimes used to eat Khara Baath when we go outside for breakfast. Very much filling. 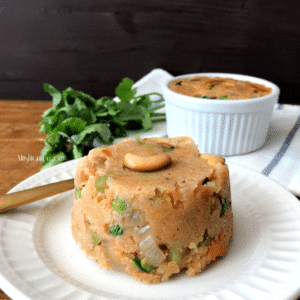 Yummy… love this for breakfast and with all the added veggies makes it filling and healthy too. I’ve not tried it with the sweet kesari. I have never tried khara bath. It sounds interesting paired with coconut chutney. 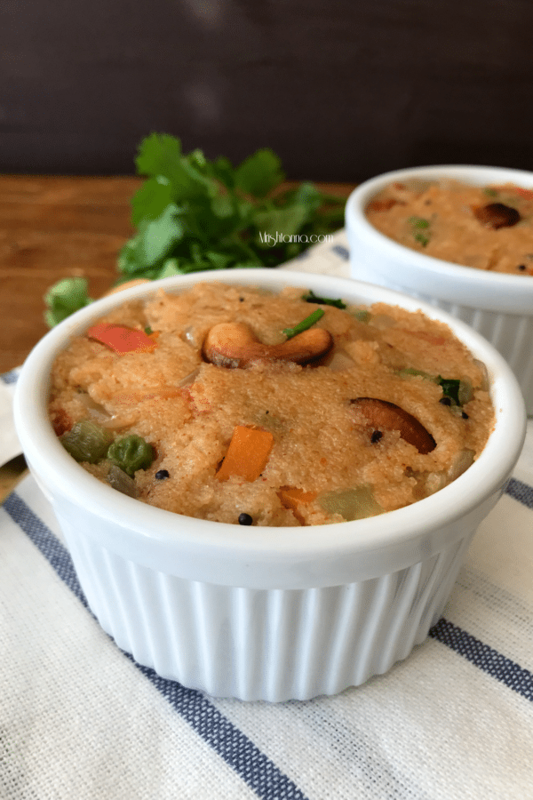 My to go recipe for most weekends…Healthy with loads of veggies and looks delicious…Coconut chutney on the side and I’m good to go!! Such a gorgeous dish to include a variety of veggies in ones meal. I am making this for sure for my son. Perfect breakfast dish. Khara bhath sounds delicious and flavourful. And vegetables made it a healthy breakfast option. I would love to have it with coconut chutney anytime. Loved your click. What a scrumptious and easy recipe for Kahara bhath. With the vegetables, it gets filling and comforting. This is one of the tastiest breakfast options of south india. Yours looks awesome. Such a delicious variety of snack/dinner. Healthy , easy and much filling. Lovely share dear. Loved ur recipe ur captures..